One thing I have noticed when refereeing my current Nalfeshnee Hack 4E game is that combat takes longer (this is of course a common observation regarding Fourth Edition). I think this comes down to three factors. The first is that HP has increased dramatically in comparison to past editions whereas damage dealing capability has not (and in some cases has regressed). The second is that the grid encourages pondering positional possibilities, much like chess. The third is that players need to make more decisions per turn due to the formalization of actions during combat, and the possibilities for each type of action tend to be heavily suggested by explicit power and maneuver lists (decreasing the need for action creativity). 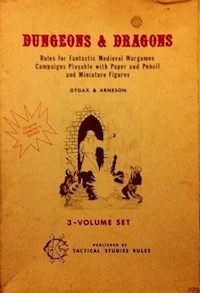 Compare player turn structure in traditional D&D to Fourth Edition. Sometimes this includes some movement, and there are limits to that movement in the rules, but the concept is not that of a resource to be spent (in my experience). Further, special powers are not used every turn, as generally they are scarce resources, so there is no obvious list to select from (though this breaks down somewhat for high level casters, as the number of spell slots increases). Should I take any free actions? Do I want to make any action substitutions? What order will I take my actions in? In practice it is of course more streamlined than that, as players develop common patterns when using certain characters, but this is itself something of a problem in my eyes because it acts as barrier to creativity (note that something similar can happen in traditional D&D also; we’ve all seen players whose actions are continually “I attack the monster with my sword”). You can see that there are quite a few possibilities, and all of them also have implications for the spacial relationship of the grid. But I think the biggest problem is what I call the economy of actions. My players feel that they need to eek out every little last drop of potential from their characters, making sure that they spend every action that they can. Did I do something with my free, minor, move, and all mighty standard action this turn? And, because of how interrelated the 4E rules are, it is very difficult to simplify this process through house rules without doing significant violence to the rest of the ruleset. For example, I considered doing away with minor actions entirely and moving back towards the traditional approach, or at least simplifying the choices to: move-move, action-move, move-action. However, many powers are primarily useful in combos (use minor power X in order to set up favorable conditions for the use of standard power Y; combos). Healing powers also tend to be minor actions. This is kind of ridiculous in my opinion, as it allows the cleric to move, shoot a laser (ahem, “lance of faith” at-will power), and then heal allies all in one turn. So such a change would also affect some classes more than others (and some “builds” more than others). Players that are used to the 4E concept of class balance tend to be unhappy with such changes. Unrelated complaint: damn it Google! Because I am in Canada, whenever I view a blogspot blog it rewrites the URL to .ca rather than .com now. Why? It’s so annoying. Whenever I want to copy and paste a blogger URL I now need to edit it because .com is obviously a more stable address. I wish they would stop redirecting me to google.ca from google.com too. When I type a URL into the URL bar, that’s really the place I want to go. Redirection should only be used for transitions where content is actually being moved. This entry was posted in Uncategorized and tagged combat, D&D 4E on March 24, 2012 by Necropraxis. I got this laptop from a friend who lives in Calgary, and it took me forever to get the browser (Chrome) to stop doing .ca addresses for everything. What I’m saying is that I feel your pain. I’m not sure if this will work, but maybe you could remove minor actions from the PCs turn, but keep the economy of actions in place. So each PC can take a Standard and a Move, or substitute a minor action for either one (or both). That way, combos consisting of one minor and one standard stay intact, and taking two minors and one standard isn’t possible anymore. In my experience, that second minor is almost always taken up by healing, and limiting that is a good thing. That’s not a bad idea, but I think this far into the game (23 sessions) some players might object. Your analysis mirrors my own observations of combat in 4E. I picked up 4E and started a campaign exactly because of the “I swing my sword at the monster” problem with older editions. But now that we are playing it the problem is “I am going to sit here for 10 minutes while I optimize my combat choices”. I had to remind myself that if the player’s are having a good time and this is how they want to spend the evening, then long tactical combat is not so bad. My player’s like it but as a DM, I do not as it just feels like they are not getting anywhere. I think one of the issues is the halfway point of battle. It is at that point where, you know the players are going to win. They have an overwhelming advantage, but you still have to play out the combat. They can’t just mop up because as you have astutely observed, damage is low and hit points are high. My last session was a 2 hour battle of 14 monsters against 6 PCs (the entire session was about 2.5 hours long). The players seemed to really enjoy it though. I think that a lot of this is player-issues. If they are pausing to figure out what to do with an action, then they lose it. I also blame the power cards. When you are flipping between lots of pages looking for what you want, then it’s going to slow stuff down. I put my powers on an excel sheet with enough detail to get through most combats (and comment notes when I need the whole decription). I color code the action charts so it’s easy to see what options I have. Yeah, I would agree about the menu effect. I have a hard time faulting my players for their decision making time, as usually I think they were quicker than I would have been given a similar number of options. I almost never had a case where I felt like a single player was holding up the game; it was slow even when players were making choices as fast as seemed reasonable. Also, I think it helped that we used Moldvay-style d6 party initiative, so if someone was taking extra time I would just go to someone else and come back to the deliberating player later, and the specific order didn’t really matter all that much.